As founder of California-based Vacuum Tube Logic of America, David Manley is at the forefront of the current renaissance in vacuum-tube audio equipment. In addition to manufacturing some highly regarded audiophile components, VTL has introduced a line of tubed professional equipment that is finding its way into recording studios. David has a lifetime of experience in tube electronics, recording studio design, disc cutting, music recording, and most recently, analog/digital and digital/analog converter design. High-end audio companies take different approaches to staying successful. One way to maintain a market position is to continue improving fundamental designs, offering a little higher sonic performance with each model. The latest products from a company employing this approach will look and operate very much like their first products. The Krell KPS-20i (KPS stands for "Krell Playback System") is essentially a CD transport and digital processor in one chassis. What make the KPS-20i different from a CD player are the unit's five digital inputs, which allow the KPS-20i to function as a digital/analog converter for external digital sources. When I taught a recording engineering program at a California college, one of my first responsibilities to new students was to clarify for them what recording engineering was really about. Many of them entered the program with the impression that recording was nonstop glamor, with a significant part of the job devoted to partying with their favorite rock bands. It was my job to tell them the bad news: Recording was more about lying on your back underneath a recording console on a dirty studio floor with hot solder dripping on your face. Procrustean bed: a scheme or pattern into which something or someone is arbitrarily forced. The whole field of subjective audio reviewinglistening to a piece of equipment to determine its characteristics and worthis predicated on the idea that human perception is not only far more sensitive than measurement devices, but far more important than the numbers generated by "objective" testing. Subjective evaluation of audio equipment, however, is often dismissed as meaningless by the scientific audio community. A frequent objection is the lack of thousands upon thousands of rigidly controlled clinical trials. Consequently, conclusions reached by subjective means are considered unreliable because of the anecdotal nature of listening impressions. The scientific audio community demands rigorous, controlled, blind testing with many trials before any conclusions can be drawn. Furthermore, any claimed abilities to discriminate sonically that are not provable under blind testing conditions are considered products of the listeners' imaginations. Audible differences are said to be real only if their existence can be proved by such "scientific" procedures (footnote 1). 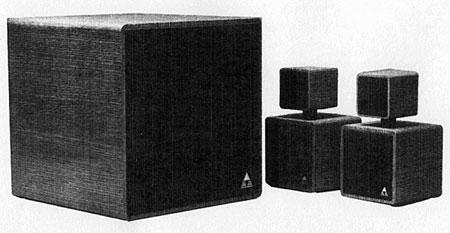 Triad Speakers has been designing and manufacturing three-piece (woofer and two satellites) loudspeaker systems since 1982. The company was formed that year by designer Larry Pexton and has enjoyed steady growth in their market niche. Their original three-piece loudspeaker was a collaboration with Edward M. Long, of "Time-Align" fame, and Ron Wickersham. It was felt that the ideal loudspeaker would have the least cabinet interference, thus the design decision to keep the woofer separate and the midrange/tweeter enclosure small. 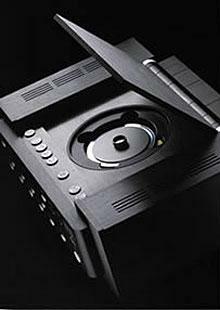 Triad speakers were selected for inclusion in the Consumer Electronics Show's Innovations 1990 Design and Engineering Showcase, the sixth time the company's products have been selected for this award. At a "Meet the Designers" panel discussion at the 1992 Los Angeles Stereophile High-End Hi-Fi Show, I asked a group of successful digital designers (footnote 1) each to state how much of a digital front end's sound quality they believed was due to the transport, digital processor, and interface between the two. There was virtual unanimity: Nearly everyone agreed that a digital processor accounts for about 50% of a digital source's sound quality, the transport 30%, and interface 20%.